Larry Gotkin’s custom, handmade scrimshaw items offer museum-quality, artisan craftsmanship for the serious collector or re-enactor. Scrimshaw originally was the product of American whalers. Sailors carved and engraved whale bone and teeth into tools, baskets, and knick-knacks, filling in the long hours and days between chores and whale sightings. Modern scrimshaw often is engraved into fossil mammoth ivory, bone, horn, and various synthetic ivory materials such as Micarta and Ultra Ivory (a new and fairly expensive substitute). The surface of the ivory is cut or pricked with a needle or hobby knife, and ink or paint is rubbed into the cut to permanently color it. It is a very long and painstaking process. 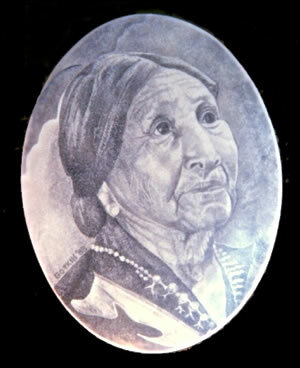 The Indian woman, shown at right, required about 80 hours to complete.